Guardians of the Galaxy Coming Soon! Remy's Ratatouille Adventure (France) Coming Soon! Epcot consists of two themed areas, Future World and World Showcase. 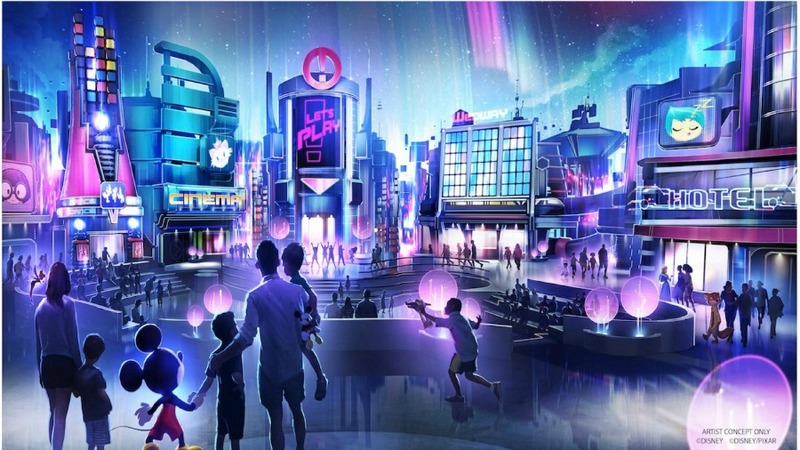 Future World features attractions that focus on energy, communication, the land and our environment, the ocean, imagination, transportation and space exploration. In the very front of the park is the iconic Spaceship Earth. 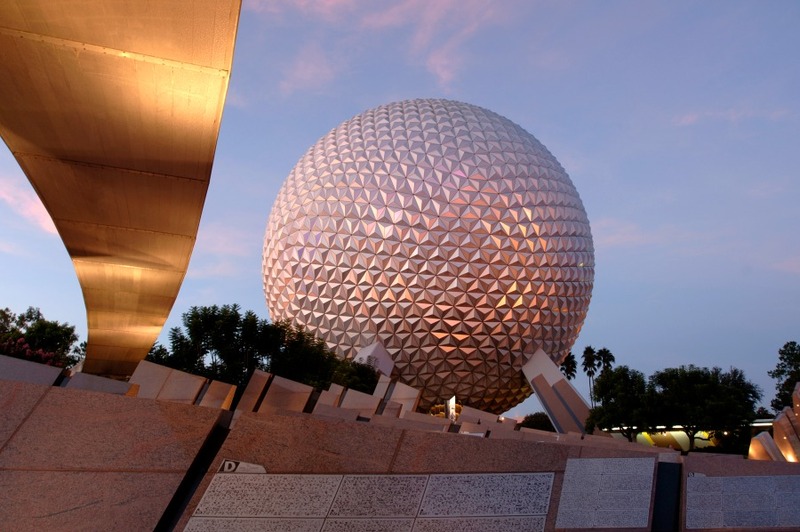 Located inside the iconic "golf ball", Spaceship Earth is a slow-moving attractions that tells the history of communication and where communication may be headed in the future. Over in The Land Pavilion, you can find Soarin' Around the World which simulates the experience of flying over landmarks around the globe! Timon, Pumba and Simba are your hosts at the Circle of Life film and the Living With The Land boat ride takes you on a tour of greenhouses and fish-production. The Seas with Nemo and Friends is a fun-filled trip into the underwater world of Nemo. The action centers around the 5.7 million gallon aquarium that is home to thousands of fish including sharks, sea turtles and dolphins. This pavilion features all of the characters from Finding Nemo. You can ride on Clam-Mobiles, have fun with the hands-on activities, and you don't want to miss the interactive Turtle Talk with Crush show. At the Imagination Pavilion you can take a fun-filled look at the senses on your Journey Into Imagination With Figment. It's rarely crowded and is a perfect ride for the days when the park is busy and you need a break. Also located in the Pavilion is the Disney & Pixar Short Films Festival which previews 3 delightful short films. Test Track takes you on an unforgettable ride. Riders get to design their own custom concept vehicle, then test it out on the track in a six-passenger SimCar. This is a great attraction but it does have a well deserved reputation for intermittent delays. Mission: SPACE simulates a realistic launch into space as you and your crew pilot your capsule to Mars. There are two versions, so choose wisely. If you have the slightest inclination towards motion sickness, pick the tamer option. Innoventions was once a "mish-mosh" of sorts with different hands-on activities featuring the latest technology. Innoventions is currently under an extended refurbishment and there's not a lot left in either of the East or West buildings, save for a few meet and greets in the Character Spot locations. Innoventions is still a great way to escape from the central Florida heat and humidity. Centered around a beautiful reflective lagoon is Epcot's World Showcase. Each country features entertainment, dining, and shopping unique to their culture. For many years, Epcot was considered an 'adult' park. Disney worked hard to overcome this reputation and most have discovered that kids can have a blast visiting Epcot, including the 'boring' countries. One of the best things that was done was to introduce Kidcot Fun Stops in World Showcase. Kids can create a free (yes, you read that right!) souvenir to take home with them. Take advantage of the Kidcot Fun Stops and think twice about watching some of the movies at several of the countries. If your child balks at one of them, they don't get better at the others. All isn't lost though; in Mexico, there is the Gran Fiesta Tour, which is a nice, slow boat ride that kids will definitely like. And of course in Norway, Frozen Ever After is an extremely popular attraction with kids. Disney Phineas and Ferb: Agent P’s World Showcase Adventure is a great kids' activity too! This mission around the World Showcase has clues that will be sent to you via text message and will allow you and your family to try and solve a mission for Agent P himself. Directing your family through 7 of the World Showcase Pavilions gives everyone the fun experience of exploring many of the countries while solving missions. Please note that each clue can take up to 30 minutes, so it can be time consuming. Every evening, Epcot presents IllumiNations: Reflections of Earth. This is well worth waiting for and is the perfect way to end your day at Epcot. NOTE: IllumiNations: Reflections of Earth will have its final presentation on September 30, 2019 then it will be replaced with a brand new limited-time spectacular called ‘Epcot Forever.’ The new show will begin on October 1, 2019, features classic Epcot tunes, and opens with a spark of imagination that grows into an epic spectacle of fireworks, music, lighting, lasers, and special effects kites. One of the absolute best features of this park is how wide open and expansive it is. If you're feeling hemmed in at the other theme parks, hop on a boat, bus or monorail and get yourself to Epcot. Upcoming Epcot Attractions and More! 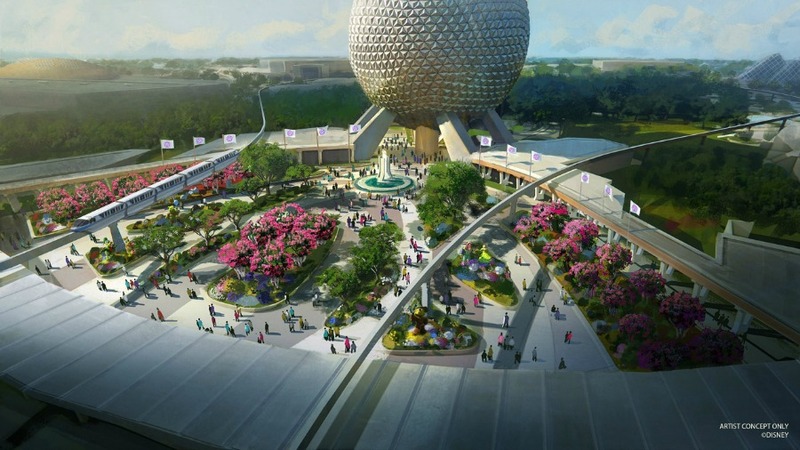 Epcot's New Entrance, New Play Pavilion, & Experience Center Coming for 50th Anniversary! The new entrance plaza to Epcot will have new pathways, greenery areas, along with a newly reimagined fountain. The new design will pay homage to the theme park's original entrance with a fresh take on classic elements. Additionally, the Leave A Legacy photos are going to be moved into a new setting located just outside the park’s gateway. There will also be “additional significant redevelopment” in the area between the Spaceship Earth attraction and the World Showcase Promenade. A new "Experience Center" is coming to the Odyssey Events Pavilion and will give guests the opportunity to look into the future at the upcoming projects that are coming to Epcot later this year. The exhibit will help guests visualize park projects throughout the entire period of transformation. On August 13, 2017, The Universe of Energy attraction closed permanently to make way for an all new Guardians of the Galaxy attraction. Disney promises that this will be an E-ticket attraction that will allow guests to step into the “rockin’ and action-packed” world of the Guardians of the Galaxy! On the ride, guests will experience the thrill and adventure of space travel. Disney says that Peter Quill visited Epcot as a kid. There has been no opening date announced. In 2014, Walt Disney Studios Park in Paris opened Ratatouille: The Adventure. The attraction has been a huge success, and now Epcot’s France Pavilion will have its very own version of the 4-D attraction! Guests will shrink down to Remy’s size as they are chased around Gusteau’s legendary Parisian restaurant. A New Australia Pavilion at Epcot? Visit our DIScussion Forums - The Largest Disney community on the internet!